How Much Salt Is In That? There’s no gentle way to say this: we eat entirely too much salt. As part of the Dietary Guidelines for Americans, the USDA recommends a maximum of 2,300 mg of daily sodium — what correlates to about one teaspoon of salt — and the majority of us get about 3,400mg.. And for senior citizens, African-Americans and those at risk for hypertension, the disparity is even more extreme; for them, the USDA recommends just 1,500 milligrams each day. But where does all that excess salt come from? Processed food. The sodium in everyday packaged, bottled and canned items is insidious: we have no sense that we’re eating something loaded with sodium, and yet the proof is on the packaging. We’ve all heard before that things like canned soups and some canned meats are salt-heavy, but what about breakfast cereals, bread and even sweet drinks? 1. 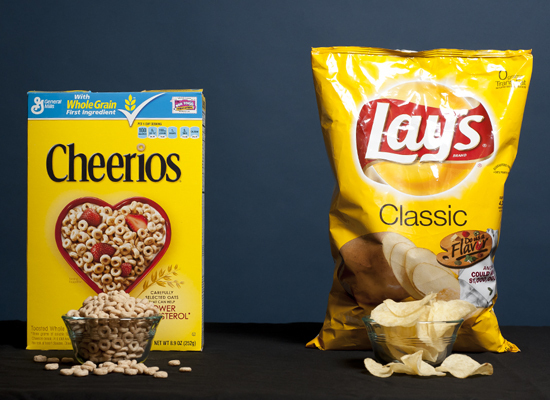 Which has more sodium, a one-cup serving of Cheerios or a 15-chip serving of Lay’s Classic potato chips? Answer (They’re about the same): Your bowl of cereal in the morning might not feel like a salty treat, but it’s packed with 160 mg of sodium. The chips have 170 mg in a one-ounce serving. But that’s not an excuse to eat potato chips for breakfast — 15 of the Lays have 160 calories and a whopping 10 g of fat (Cheerios sans milk have 100 calories per serving and 2 g of fat). 2. 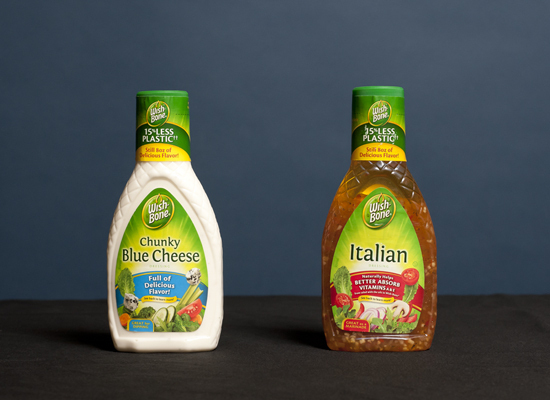 Dressing face-off: Which has more sodium per two tablespoon serving? Answer (Wish-Bone Italian Dressing): The Italian dressing has 340 mg of sodium, while the blue cheese has 270 mg. We know vinaigrettes are often the lower-cal, lower-fat dressing option compared with their creamy counterparts — but don’t forget to check sodium levels, too, when evaluating your nutrition labels. Or, why not make your own at home? 3. 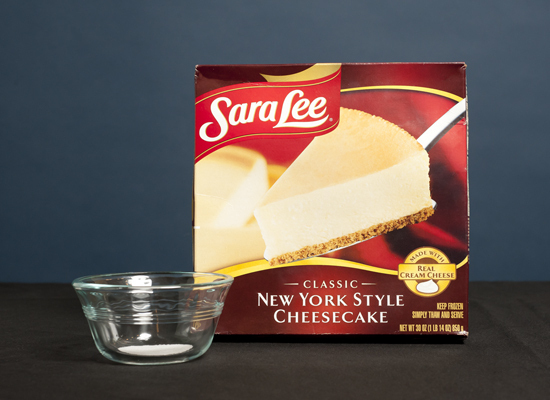 The amount of salt in a slice of this Sara Lee Classic New York Style Cheesecake adds up to how much of your recommended daily intake? Answer (42 Percent): It might be dessert, but that doesn’t mean it’s not loaded with sodium. Each piece also packs 480 calories and 29 grams of fat. 4. 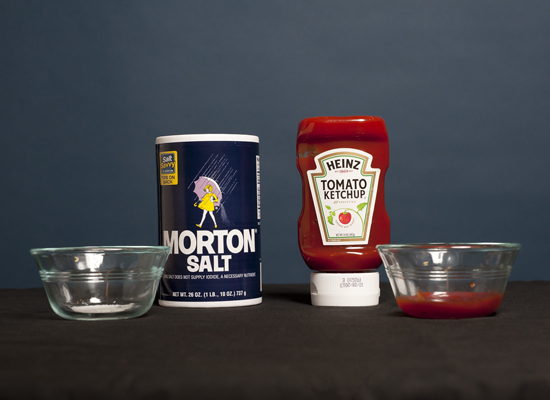 Condiment reality check: Two tablespoons of Heinz tomato ketchup has how much sodium? Answer (320 mg): While a one-tablespoon-sized serving has 160 mg (still high at 7 percent of your recommended intake), a more realistic (at least on our plates!) two-tablespoon portion has 320 mg.
5. Which breakfast item has the most sodium? 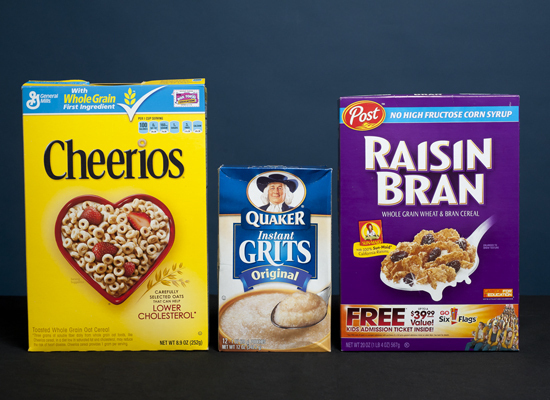 Answer (One packet of Quaker instant Grits): While all the breakfast items have some positive nutrition characteristics (the grits are high in iron, the raisin bran is loaded with fiber and the Cheerios have heart-healthy whole grains, to name a few of the most notable), the grits are loaded with the most sodium. They have 310 mg in one serving, compared with 160 mg in the Cheerios and 250 mg in the Raisin Bran. 6. Yup, drinks have sodium, too — in fact, all three of these do. Which is the worst offender? 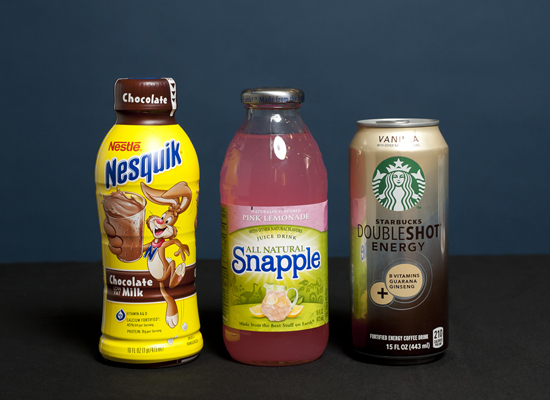 Answer (A bottle of Nestlequik Chocolate Milk): At first blush, the Starbucks can and the Nesquick seem neck and neck, but there’s actually two servings in the chocolate milk bottle. And that brings the grand total for the whole thing up to 320 mg. The Starbucks and the Snapple have 180 mg and 85 mg, respectively. 7. 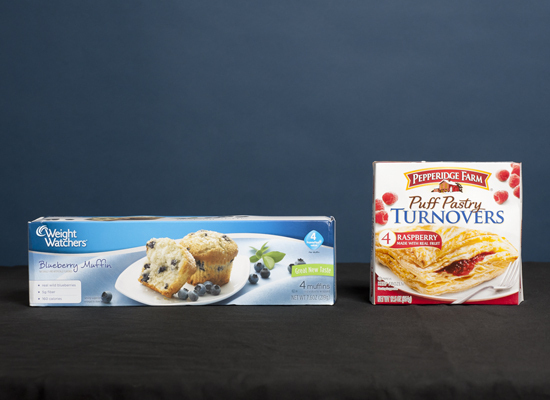 Which has more sodium, a Weight Watchers Blueberry Muffin or a Pepperidge Farm Puff Pastry Turnover? Answer (One Muffin): They might be a “diet” food, but that doesn’t mean the muffins are low in sodium. While they trump the pastries in terms of fewer calories and grams of fat, they have 270 mg of sodium, compared to 230 mg in the turnover. 8. Chocolate showdown: Which single serving size has the most sodium? Answer (Four Entenmann’s Pop’ems donuts): The donuts take the cake for this one — though all four treats have sodium. 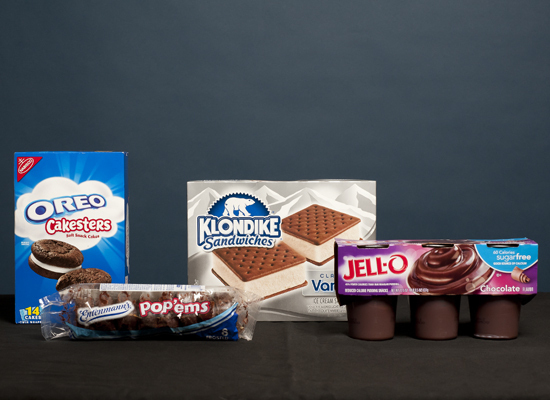 The Cakesters have 250 mg, the Entemann’s donuts have 310 mg, the Klondike bars have 150 mg and the JELL-O pudding has 180 mg.
9. 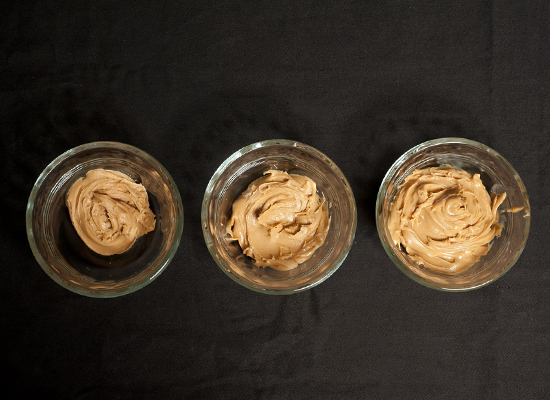 Which cup contains a serving of peanut butter, with 170 mg of sodium? Answer (Two Tablespoons): Here comes the portion police: just two tablespoons of peanut butter comprises a serving, which has 170 mg of sodium and also 180 calories and 12 g of fat. 10. Which has more sodium? Answer (Breakston’e 2% Milkfat Lowfat Cottage Cheese): While the cottage cheese has more protein and less cholesterol, it also has more sodium — 340 mg per 1/2 cup serving. 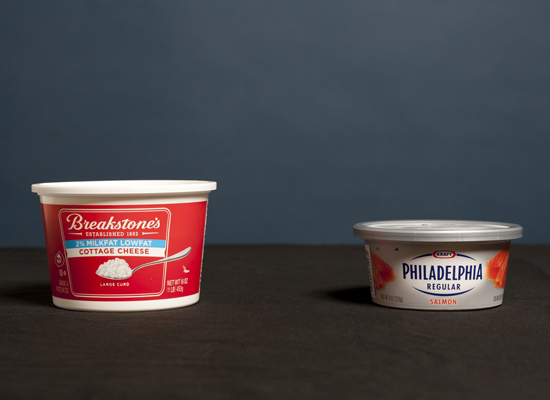 The cream cheese has 210 mg per 2 tablespoon serving. 11. 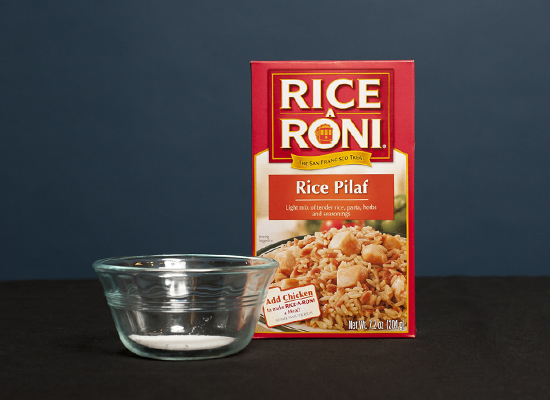 When it comes to sodium, what percent of your recommended daily intake does a whole package (three cups) of this rice pilaf have? Answer (120 percent): One serving (about one cup) of this rice pilaf has 970 mg of sodium, or 40 percent of your recommended daily intake. Triple that to eat the whole box, and you’ve exceeded a whole day’s worth. 12. 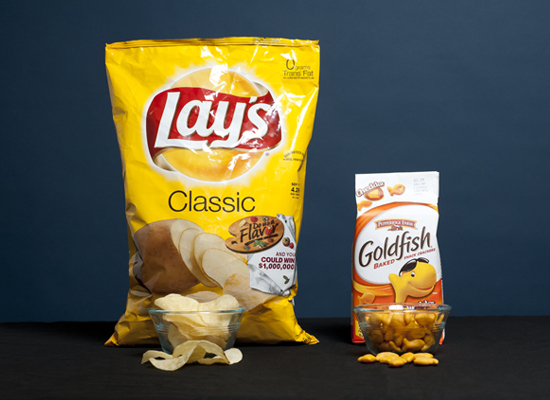 Potato chips vs. Goldfish crackers: Which snack has more sodium? Answer (One serving of Pepperidge Farm Goldfish Baked Snack Crackers): The crackers might be baked instead of fried, but that doesn’t mean they have less sodium than fried potato chips — one serving is loaded with 250 mg.
13. Think sweets don’t have sodium? 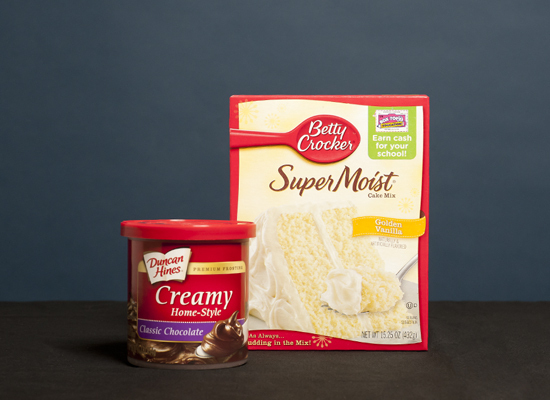 Think again — how much will a slice of this cake (1/10 of the whole thing) and two tablespoons of frosting set you back when it comes to sodium? Answer (410 mg): Yup, that’s right — the cake alone has 13 percent of your daily sodium intake — before the icing, which clocks in at about 100 mg.
14. Thirsty? 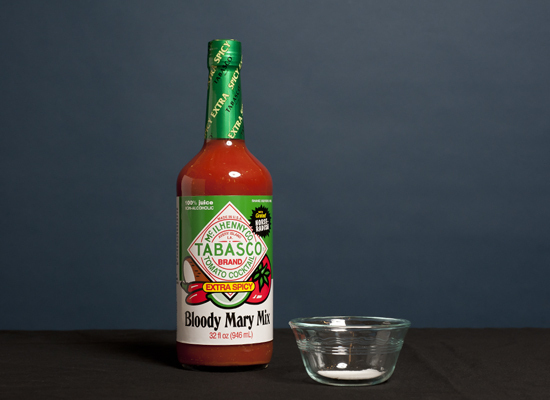 A one-cup serving of this Tabasco brand Bloody Mary Mix has 70 calories … but how many mg of sodium? Answer (1,900 mg): You may want to hold off your “cheers” until you read this — just one cup of the mix has 1,900 mg of sodium, which is almost 80 percent of your recommended daily intake. 15. Which breakfast item has the most sodium? 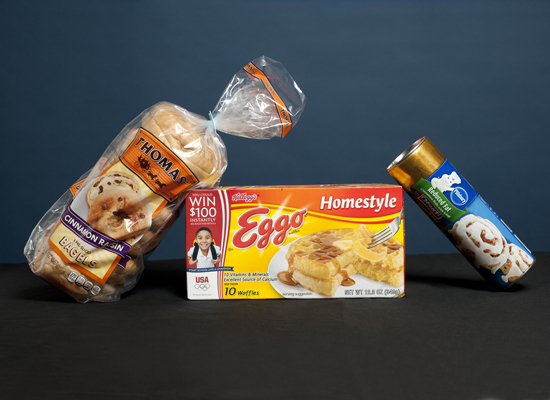 Answer (One Thomas Cinnamon Raisin bagel): All three of these have a similar amount of sodium — the bagel, waffles and cinnamon roll pack 380 mg, 370 mg and 340 mg, respectively. But the bagel (and that’s sans cream cheese) still has the most. Posted on July 24, 2012, in Healthy Fab and tagged curly girl fitness, fitness, food, health, healthy-living. Bookmark the permalink. 1 Comment.